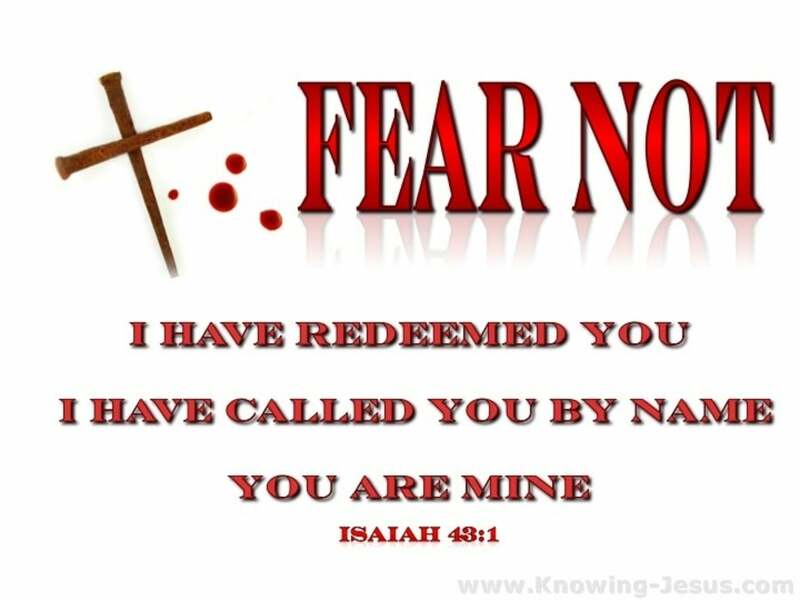 While many focus on the “fear not” aspect of this verse I think the key is the last part I have called you by name, you are mine. Yes in context this verse is speaking to Israel (we were obviously not around) but taking the “Whole Counsel of God” come to understand it is applicable to us today. With that in mind lets take another look; the obvious Fear not, why because we (God’s chosen people, Jew and Gentile who from before the foundation of the world were laid Eph 1:4) have been redeemed. Then things get real personal God says I have called you and not just any call but personally by name. Why does God do this and not just send a messenger after all He is pretty busy one would think running the universe; because you are mine (we are His). Isaiah 43:1. – Isaiah 43:7. Great stress is laid on names in Scripture. These two parallel and antithetic clauses bring out striking complementary relations between God and the collective Israel. But they are as applicable to each individual member of the true Israel of God. I. What does God’s calling a man by his name imply? 3. Designation and adaptation to work. Bezaleel- Exodus 31:2; Cyrus- Isaiah 45:3; Servant of the Lord- Isaiah 49:1. II. What does God’s calling a man by His name imply? 2. Kindred. The man bears the family name. He is adopted into the household. The sonship of the receiver of the new name is dimly shadowed. We must bring into connection with the texts the prominence given in the Apocalypse to analogous promises. thou art mine; such as are redeemed by Christ, and called by his grace, they are his Father’s gift, and his own purchase; they voluntarily give up themselves to him, under the influence of his Spirit and grace; they are his by profession and possession; they are his portion, people, sheep, and spouse; and his interest in them, and theirs in him, serve to prevent fear; such need not fear wanting anything, nor any enemy, nor perishing, or miscarrying of heaven and happiness, to which fears they are subject.